"The Gospel of Thomas is a New Testament-era apocryphon completely preserved in a papyrus Coptic manuscript discovered in 1945 at Nag Hammadi, Egypt. The book was bound in a method now called Coptic binding. Unlike the four canonical gospels, which combine narrative accounts of the life of Jesus with sayings, Thomas is a "sayings" text, a collection of logia, which takes the less structured form of a collection of sayings attributed to Jesus (including brief dialogues), the writing down of which is credited in the incipit to Didymus Judas Thomas. The words Didymus and Thomas are both translated "twin" giving emphasis to the name Judas, a derivative of Judah. The gospel does not have a narrative framework, nor is it worked into any overt philosophical or rhetorical context. All the texts have been available to the general public since 1975. The Gospel of Thomas has been translated, published and annotated in several languages. The original manuscript is the property of Egypt's Department of Antiquities. The first photographic edition was published in 1956, and its first critical analysis appeared in 1959. The Gospel begins with the words, "These are the secret sayings which the living Jesus spoke and which Didymus Judas Thomas wrote down. And he said, 'Whoever finds the interpretation of these sayings will not experience death.'" 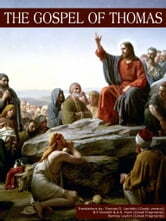 The work comprises 114 sayings attributed to Jesus. Some of these sayings resemble those found in the four canonical Gospels (Matthew, Mark, Luke, and John). Others were unknown until its discovery, and a few of these run counter to sayings found in the four canonical gospels. When this Coptic version of the complete text of Thomas was found, scholars realized that three separate Greek portions of it had already been discovered in Oxyrhynchus, Egypt, in 1898. The manuscripts bearing the Greek fragments of the Gospel of Thomas (P. Oxy. I 1; IV 654; IV 655) have been dated to about AD 200, and the manuscript of the Coptic version to about 340. Although the Coptic version is not quite identical to any of the Greek fragments, it is believed that the Coptic version was translated from an earlier Greek version."